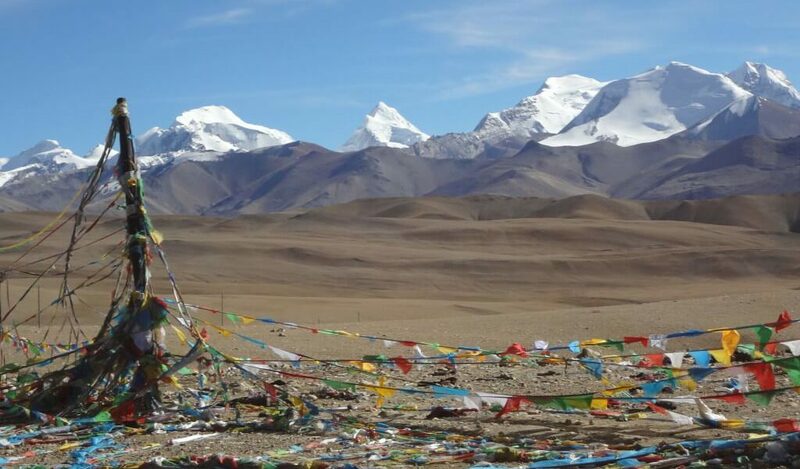 Experience Tibet Everest base camp tour, a fascinating and mesmerizing journey which you will enjoy for sure as this trip not only leads you with immense scenery of Tibetan vast landscapes and snow clad high peaks, culture and age old traditions as it was since past hundred of centuries. Experience Tibet Everest base camp tour a journey of a lifetime experience where you will be within world’s highest and largest plateau of Tibet with exceptional and marvelous views along the drive with overnight in local guest house and tourist standard hotels. This marvelous journey starts from the capital of Nepal in Kathmandu heading towards due North within Central Himalaya with Ganesh-Langtang and Jugal Himal range of peaks to reach at Tamang tribes country in Rasuwa around Langtang Himal. Drive leads past nice and interesting rural farm villages and towns to enter into a newly opened frontier of Nepal / Tibet-China at Raswagaddi and Kerong village and towns, where our Tibetan counterpart native Tibetan guide and drivers will receives you and then heading into Tibetan soil and territory for a week or more. A scenic overland drive leads on vast Tibet’s tableland with amazing views to reach first at Everest Base Camp with sweeping scenery of snow capped peaks that borders Nepal and Tibet, at Everest Base camp located past famous and old Rongbuk Monastery area. With interesting and exciting time our journey continues heading towards the main big cities at Shigatse after crossing the highest pass of the adventure over 5,220 m at Gyatchu-La, in Shigatse which is the second biggest city in Tibet after Lhasa, with glorious time exploring its beautiful monuments around Tashilumpo Monastery complex. Shigatse seat of His Holiness Panchen Lama which is 2nd important after Dalai Lama, from here heading towards Gyantse another interesting areas for nice visit looking at Kumbum and Palkor Monastery of great significant. Adventure continues towards fabled Lhasa city after driving through beautiful turquoise Yamdrok Tsho Lake and over scenic Khamba-la pass with grand views of the country, and then slowly reaching into the hub of Lhasa city in the shadow of magnificent Potala Palace. In Lhasa with time to explore its interesting sites and old monuments which includes Drefung-Shera monasteries with Jhorkhang Temple the oldest religious sites of Tibetan history and then tour of colorful Barkhor Market Square where you can observe pilgrims from all around Tibet. Last and not the least tour of magnificent Potala Palace known as Heavenly Realm for Tibetans, the landmark of Tibet, houses 1,000 rooms official and non-official rooms inside the palace where few important rooms are allowed for visitors. Day 01: Drive to Syabrubesi 1,460 m – 07 hrs journey. Day 02: Drive to Kerung Border 2,890 m – 04 hrs drive. Day 03: Drive to Shegar or New Tingri 4, 350 m – 06 hrs. Day 04: Drive to Rongbuk Monastery 4,950 m – 04 hrs. Day 05: Visit Everest Base Camp and drive to Larze 4,160 m – 06hrs. Day 06: Drive to Shigatse 3,900 m – 04 hrs afternoon visit Tashilumpo Monastery. Day 07: Drive to Gyantse 3,950 m visit Phalkor Monastery and Kumbum Stupa -03 hrs. 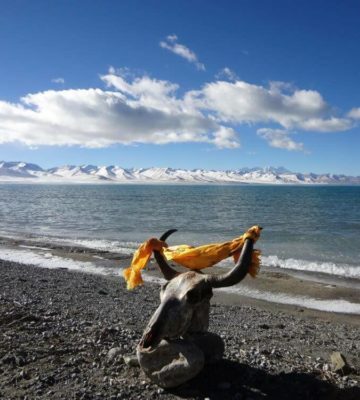 Day 08: Drive to Lhasa 3,650 m via Yamdrok Tsho Lake – 05 hrs. Day 09-10: In Lhasa with sightseeing tour at places of great interest. Day 11: Drive to Lhasa / Gongor Airport and fly to Kathmandu – 1 hr: 15 mins flights. Drive to Syabrubesi 1,460 m - 07 hrs journey. Starting our marvelous journey with an overland drive towards North West of Kathmandu past farm villages and towns with grand views of snowcapped peaks and then reaching at cooler areas within Langtang Himal in Dhunche 1,900 m high, a main and headquarter town of Rasuwa district around Langtang area, populated by Tamang people the hill tribe of Nepal. From here downhill for two hours with overnight at Syabrubesi, the door to Langtang, Ganesh and into Tamang Heritage Trail and as well to Tibet border. Drive to Kerung Border 2,890 m -04 hrs drives. From Syabrubesi morning drive on newly built road linking Nepal / Tibet border to Rasuwagadhi (1800m / 15 km / 1 hr min from Syabrubesi), here received by our Tibetan counterpart guide and drivers, after completing immigration & custom formalities on both side of the frontier Nepal / Tibet at Rasuwagadhi, continue drive further to Kerung county with first overnight stop in Tibet accommodation at local guest-house. At Kerung afternoon with time to relax and enjoy views of Ganesh and Langtang Himal that borders Nepal and Tibet. Kerung is also a famous religious and historical place, home of 11th Centaury great saint and Guru Milarepa known for his tantric wisdom as well a poet and folk singer, his song are still remembered by local herdsman and villagers. Drive to Shegar or New Tingri 4, 350 m - 06 hrs. From Kerung onward where Tibetan high plateau begins as morning drive leads past Tibetan farm villages to reach on top of Lalung-la Pass (5,050m) with views of Mt. Shisapangma (8013m highest within Tibet). After Lalung-la drive leads on vast Tibetan plateau with high and dry terrain to Old Tingri with first glimpse of Everest and Cho-Oyo peaks, from here few hour drive to Shegar also known as New Tingri and then transfer to your hotel or lodge for overnight stop. Drive to Rongbuk Monastery 4,950 m and to Everest BC. From New Tingri and Shegar (Xegar) our route diverts away from main highway towards North Everest base camp and Rongbuk area. As drive leads over scenic Pang-la pass at 5,200 m high offering super panorama of world highest peaks including Mt. Everest, Makalu, Cho-Oyu and adjoining peaks, from here descend to Tashi Dzong village to reach Rongbuk Monastery and its many smaller hermitage caves. This holy and remote sacred spot first introduced to the world in 1920's by 1st British expedition teams of George and Irving Mallory as well a famous novel by James Hilton 'Lost Horizon'. At present most of retreat cells are abandoned with only few small shrines scattered at end of the valley. According to Rimpoche (high priest) of Rongbuk, this monastery was first built as a religious place past 250 to 350 years ago. Visit Everest Base Camp and drive to Larze 4,160 m - 06hrs. After a time in Rongbuk with overnight stop, take a local taxi or horse cart to reach at Everest North Base Camp, or one can walk taking 3-4 hours both ways. To save time better on horse cart or motorbikes serving as local taxi takes about 45 mins to an hour to Everest Base Camp at an altitude of 5,200 m high, rewards you with super full views of Mt. Everest with other adjoining peaks and Rongbuk glaciers. Everest in Tibet known by the name Chomolungma means 'Great Mother' after a wonderful time at base camp return back to Rongbuk Monastery, and then continue drive on the same route to Shegar. From Shegar drive leads over highest pass of the journey at Gyatchu-La at 5,220 m high festooned with thousand of Buddhist prayer flags and religious offering, with time here heading downhill on winding road to reach at Larze town for overnight stop. Larze a growing town located on Nepal-Tibet / China Friendship Highway as well on the road to holy Mt. Kailash and Lake Manasarover towards Tibet's Far South West, which is near to Sakya Monastery and towards our destination at Shigatse. Drive to Shigatse 3,900 m - 04 hrs afternoon visit Tashilumpo Monastery. From Larze town, morning drive is short of few hours on good road to reach at Tibet's second largest city in Shigatse drive continues past rural farm villages and well tended fields of barley-wheat and yellow mustard. After an enjoyable ride reaching at Shigatse where hotels are much better than past few night stops, in Shigatse transfer to excellent hotels with modern facilities of Wi Fi and money change at its exchange counters. Having lunch getting refreshed a short drive in the hub of Shigatse for marvelous tour of famous Tashilumpo Monastery complex adorned with Golden Roofs here visit the monastery interior of great interest with tomb stupa of several late and past Panchen Lama. Panchen Lama the 2nd biggest priest and holiness after Dalai Lama (present XIV Dali Lama who is exile in India) With enjoyable tour of the monastery and the seat of Panchen Lama visit the local colorful Tibetan market and return back to hotel. Drive to Gyantse 3,950 m visit Phalkor Monastery and Kumbum Stupa -03 hrs. Morning getting refreshed with breakfast, continue drive towards eastward for few hours to reach at Gyantse another large city of Tibet, where in early 19th and 20th century was a flourishing place where trade between Nepal-Bhutan and Sikkim used to take place. On reaching at Gyantse transfer to another nice hotels or guest house with afternoon tour of old Phalkor Monastery and great terracotta Stupa of Kumbum, famous historical monuments located within great surrounding walls of this holy complex. Drive to Lhasa 3,650 m via Yamdrok Tsho Lake - 05 hrs. Morning our drive leads to our next highlight of the journey heading towards the fabled city Lhasa, drive leads past Simi-La pass within great Tibetan plateau where you can watch Yaks and other cattle grazing on huge green meadows. As the ride progress heading towards a scenic Karo-La pass of above 5,050 m with close views of Nzongkhangsa peaks at 7,100 m high where ice falls and glaciers flows near to the road head. Here enjoy the views as well observe the traditional life of Drokpa (Nomads) and Yak herder then reaching Nagarktse town and beyond towards beautiful turquoise Lake of Yamdrok Tsho then on high hills to reach another scenic Khamba-La pass at 4,800 m high. Khamba-La offers super panorama of Tibetan tableland and landscapes with distant views of snowcapped peaks and of Yamdrok Tsho Lake. From here after marveling the scenery heading downhill to come across a bridge over Yarlung Tsangpo / Brahmaputra River, slowly our overland journey reaches in the heart of Lhasa city in the backdrop of magnificent Potala Palace. At Lhasa our hotels located on the old part of Lhasa within east areas near colorful and exciting Barkhor Square and its markets. In Lhasa with sightseeing tour at places of great interest. These two days engrossed with ever exciting tour around Lhasa important places of immense interest within its historical and religious sites, beginning with short drive west of Lhasa towards a hill top with tour of old Drefung Monastery, in the early day home of all high priest and Dalia Lamas before Potala Palace was built. Here visit the main prayer halls with monks on deep prayers where Drefung means a heap of rice with its white washed buildings as it looks from distance views, after a great interesting visit drive to Shera Monastery where you can witness young monks on exciting debate, which deepens their knowledge of all types to reach their priesthood. Shera monastery located north of Lhasa after an interesting time with lunch break in local Tibetan / Chinese restaurants, afternoon tour of magnificent Potala Palace known as 'Heavenly Realm' with 1,000 rooms where visitors can tour only the main important interior of 8 to 10 rooms of great significant. Potala Palace stands as Landmark of Tibet situated in the hub of the city, where high and superior priests Dalai Lama lived till the last 14th Dalai Lama, at present turn into a museum. After a grand tour head back into busy and colorful Barkhor Market Square with time to visit Jhorkhang Temple, the oldest religious sites of Tibet. As the day end in Lhasa, with time for individual activities around Lhasa before dinner time on last day in Lhasa. Drive to Lhasa / Gongor Airport and fly to Kathmandu - 01 hr: 15 mins flights. Morning as per the given time by our Tibetan guide, depart from the hotel for an hour drive which leads outskirt of Lhasa city area and then on nice newly built highway entering few wonderful tunnels to reach at Gongar airport. Here bidding farewell to our Tibetan guides and ever smiling friendly drivers entering the terminal for visa and passport formalities with custom check. Board in Air China for super panoramic flight of over a hour to Kathmandu during airborne breathtaking views of Himalayan chain of peaks with close views of Mt. Everest and Mt. Makalu as the flight finally lands at Kathmandu Tribhuvan International Airport. Here after migration and visa formalities heads outside the terminal, where our staff transfer you back into your hotel, with much time in the afternoon for individual activities and shopping. Overland drive on private vehicles, a Four Wheel Drive in Tibet Airfare as per the itinerary Kathmandu / Lhasa /Kathmandu. Expenses of personal nature on tour and journey in Tibet, gratitude (tips) hard / soft drinks throughout the trip. Personal gear and medical kit. INFORMATION FOR TRAVEL TO TIBET: Tibet’s vast landscapes includes world’s highest and largest plateau although changes has taken place with wide network of roads and railway lines with tall building around the major cities of Lhasa-Shigatse and Gyantse, but still remains one of the most interesting country retaining its past glory into its pristine forms. Tibet with limited facilities for travelers especially outside main cities is now approaching to a reasonable standard. The road between Tibet and Nepal is not up to standard at places. It is rough, bumpy and full of bends which is often obstructed temporarily during monsoon months. However our Tibet counterparts will do the very best with effort under the circumstances to ensure your holiday in Tibet a smooth and pleasant. Altitude sickness: Traveling in Tibet involves high altitude areas could be strenuous sometimes, travelers with known heart or lung or blood diseases needs first doctor's advice before booking Tibet trip. It is always advisable to drink at least 2-3 liters of water every day while on the tour against AMS (Acute Mountain Sickness) and dehydration. Clothing accessories: The climate in Tibet with high altitude remains cool throughout all year round. From October till March, warm clothes such as thermal underwear are required. April to September, light clothes for the day and warm jacket or a sweater must for the evenings. The other recommended items are: personal medical first aid kit, water purification tablets (though mineral water can be bought), toilet & tissue papers, flashlight, comfortable walking shoes, sleeping bag, dust mask, sun hat, sun glasses and sun block cream. Head wear: Head wear is important to keep your body warm and to save you from UV as well, above 3,000 meters strong light of UV due to thin air hat or caps will be good as protections; Woolen cap for morning and night time. Body wear (this all required on your duration of Holiday): T-shirts, Short Pants, Trousers: Light weight & Heavy weight for cold temperature above 3500m, Wind and water Proof trousers are also suitable for trekking, Track-suit useful for trekking, Lightweight long sleeved shirt (this will save from sunburn as well), Thermal underwear useful for cold at night, Down / Duvet jacket which is essential for trekking above 3000 m, Gloves, water and wind proof wear or Poncho, snow gaiters for Trekkers above 4000m. Foot wear: For normal tours and sightseeing a runners and sports shoes is the best, as this involves short walks and climbing on steps also. For hiking a good comfortable boots if possible water proof (wax polish to be carried on other leather boots and shoes against wet areas and snow) with warm woolen shocks and for leisure walk soft cotton socks. Equipments: Daypack: A small rucksack as day to carry your necessary and valuable items; camera, water bottle, money, passport, towel, toiletries items, water proof for the walk and Sleeping Bags and walking poles as options. Personal: Camera and batteries, spare passport photos, water bottle, money belt, Torch / Flash Lights, Sewing kit, Sunhat/ Sunglasses, Ipods, Books, Wet Ones, Detergents to wash clothes, Writing materials, Swiss Army knife, Calculator, Personal toiletries, including tampons, Contraceptives, Insect Repellent, Sunscreen. Note: If you are wearing glasses, it is advisable to bring a spare pair since opticians are few on route trekking traveling remote areas. If you wear contact lenses you may find that climatic changes and dust can create visual irritation, therefore, it is advisable to bring a pair of glasses. Customs: No prohibition on still and video cameras, tape recorders or radios as long as they are registered with custom officials and are of personal use. Printed matters considered unsuitable by the Chinese govt. are prohibited specially books and pictures of Dalai Lama or any other monks and priest on exile. Booking formalities and visa: Minimum one week is required to book the trip from Kathmandu in advance along with full deposit, passport for visa process and full payment of the tour should be made before Tibet departure. From overseas, at least 2 weeks with all your personal and passport details are required with payment required as per our company rules and regulations. Cancellation: In-case of tour cancellation prior to departure, a cancellation policy as per company's rules and regulation will be applied. Risk and Liability: Tibet tours are run strictly under TIBET TOURISM BUREAU, Holiday Nepal and our counterpart Tibet agents shall not be responsible for any changes or cancellation of the programs due to road blockade, cancellation of flight, sickness or accident, political unrest etc. Any extras cost thereof shall be borne by the clients. Time Zone: Beijing Mean Time (GMT + 7:45 Hours). Which is 2 hrs 15 minutes ahead of Nepal Standard Time. Currencies in Tibet Chinese Remimbin Yuan which is 1 Yuan to US$ 8 but subject to change any time. Four different seasons in Tibet - winter, spring, summer and autumn. The best period to visit for plant lovers is in spring, when flowers are in full bloom. The mountain slopes are covered with beautiful and colorful flowers. Spring season starts from early March to late May. Even though days are clear haze disturbs the mountain views. Late May, and the downpour begins. It continues till late August. Autumn / Fall season begins from September to mid November. With temperate climate, clear blue skies and extraordinary mountain views it is the best season to visit the country. Winter begins in late November and continues till late February. Package cost includes: Air fare Kathmandu-Lhasa-Kathmandu, hotel/guest house accommodation on bed and breakfast basis, sightseeing tour as per the itinerary, an English speaking guide, transportation by private vehicle during the tour and monastery entrance fee. Cost excludes: Airport departure tax, lunch and dinner, Nepal re-entry visa fee, air ticket reconfirmation charge, personal insurance, emergency evacuation or any charges in case, if required, expenses of personal nature etc. Travel in Tibet are restricted by the Government of China where visitors can enter in a group wise with proper travel Chinese and Tibetan agencies, where Destination Holidays have counterpart agents to make your travel safe and enjoyable. Note: Please don’t forget to check with your Doctor & get advice whether your health permit or not for Tibet and its high altitude destinations. Medical Supplies: In every trip we do provide with essential comprehensive medical kits however you may carry your own medical kits as per your doctor’s recommendations. List of some recommended items: Band Aids / Bandages, laxatives, upset stomach remedy, anti-diarrhea remedy, Panadol /Aspirin, rehydration remedy, antiseptic cream/powder, sterile dressings, any relevant course of medication such as contraceptive pills. Currency: The official currency in Tibet is Remimbuin Yuan, One Yuan is made up of 100 Zian a smaller unit. There are small bills and coins denominations of one, two, five and ten Yuan and bank notes in denominations of 1,2, 5, 10, 20, 50, 100, Remimbuin Yuan. There is no restriction on the amount of foreign currency or travelers checks brought into Tibet. At present since 2000 till now US$ 1 = 8.9 Yuan but subject to change any times. Money Exchange: Bank of China (National Bank) does set the exchange rate and listed into daily news paper. There are many money changer counters and Banks in the cities at where you can change your cash money. When you are changing money officially, you need to show your passport and get receipt with your identity. The Hotels do change the money however they do have lower rate. There are various ATM Machines in main cities and towns like Lhasa, Gyantse and Shigatse and so on. Where you can get cash (only Yuan) on both Visa and Master Card’s 24 hours a day. Usually you can draw Maximum 10,000 Yuan day from your Card. Accommodations: In Tibet most places have tourist standard facilities depending upon the choices, as we have put a lot of effort into locating the most appropriate type of accommodation for each tour. It will always be clean and hygienic, comfortable and of a very high standard. Accommodation for Tibet trips is in a combination of good standard tourist class hotels and Guest Houses in the Treks operated by the local people, which offer Twin Sharing accommodations, please be prepared for the common Bathrooms. Travel / Medical Insurance: Travel / Medical insurance a compulsory in all Destination Holidays trips, all clients MUST be insured to cover personal accident, medical expenses, cancellation, curtailment and repatriation. Please Note you should check that your insurance policy is adequate for Trekking & Tours in Tibet. Tipping & Bargaining: Tipping in Tibet is not compulsory but it is a way of traditions handed by earlier visitors this might be expected by the guides, porters and Tour Driver, any gratuities for good service will be gratefully accepted at the end of the tour. Bargaining is kind of culture, especially in markets when hiring the Local Vehicles, Buying the Jewelries and Local Clothing. Passport: Your passport is a valuable document and you should exercise extreme care in keeping it safe. We recommend that you keep your passport on you at all times, preferably in a money belt that is worn under your clothing. We advise that you take copies of relevant pages in your passport and any visas that you may purchase in case of loss or damage. Your tour leader will require your passport details at the pre-departure meeting. Again, we recommend that you have a photocopy of your passport details, kept separate. Your passport must be valid for six months after the END of your tour, and must have one blank page for each country to be visited. Visa Requirements: Traveling into Tibet with various means of transportations, as there are many ways to enter the mainland but few entry into Tibet Autominous state of China, as China a huge country in Asia, the entry point from Vietnam, Hong Kong, Kajistan, Russia, Mongolia as for Pakistan being a close ally does not require Visa for Pakistan national, however the entry point from Pakistan is limited on the south west of China and Tibet. On reaching main land China one can enter Tibet via flight, trains or on surface where special entry permit required on entry immigration posts. From India only one points from western Tibet only for pilgrimage purpose to Mt. Kailash and Lake Manasarover. For those who travel into Tibet from Nepal, must obtain permits and Visa from Nepal through Chinese Embassy. Please note that; Once the visa is issued, it will not be amended, revalidated and visa fees will not be refunded. Please also note that most of the western and Asian countries including Australia, Hong Kong, Malaysia, Singapore, Taiwan, and Indian Nationals of the following countries must apply for a tourist visa through Nepalese Embassies as they do not get visas on arrival at the entry points. TTB-Tibet Tourism Bureau that the Tibet permit application commenced from March 23rd 2015 much earlier this year in comparison with previous years. Tibet travel permits policy: For the upcoming Tibet tour season, we accept Tibet tour booking for entry date from April onward for more than 3 pax minimum groups. This is subject to change and we will keep travelers informed, to avoid urgent permits policy change and permits delivery, we still suggest foreign tourists confirm a Tibet trip at least 3-4 weeks in advance. Entry validity: The validity of visa dates is counted from the date of arrival in Tibet which is six months from the date of issue. Visa Extension: A tourist visa can be extended from the Department of Immigration in Lhasa Immigration Office for a total of 2 weeks. Over the course of a visa stated, a tourist cannot stay in Tibet more than the days obtained. Tibet travel documents general information: Chinese Visa, which can be applied in Chinese Embassy from respective country (If you go to Tibet via mainland China). Please be aware that: if you enter Tibet from Nepal, no China visa but Tibet Group visa is needed.